About as perfect as a daylily can get. Looks so good you could just "eat it with a spoon"! I have been hybridizing daylilies for two years, now, and have found it to be a most rewarding hobby. I am a member of the American Hemerocallis Society, and I highly recommend membership to anyone interested in daylilies. I hope you enjoy my photo pages. in Gulfport, Mississippi, in November, 1998. A Black Senior Doe named "Judy's U-GO-GIRL"
of all breeds. I was VERY happy! You are welcome to view more photos of show-winning rabbits by browsing my website. We not only raise Dutch, but also Netherland Dwarfs and Florida Whites. 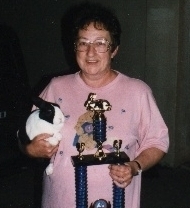 I raise and show Netherland Dwarf rabbits in partnership with my very, very best friend, Barbara Stanga. Click the rabbit to go to our page. I am a member of the American Rabbit Breeder's Association, Inc. and have held my Rabbit Registrar's license for over 18 years. I also hold memberships to the American Dutch Rabbit Club, American Netherland Dwarf Rabbit Club, Louisiana Rabbit Breeder's Association, Inc., Southern Dutch Fanciers, All-Southern Rabbit Show Circuit, and the Louisiana Dutch Rabbit Club in which I hold the office of Secretary-Treasurer. I am the Vice-President of Southern Dutch Fanciers as well a the Sweepstakes Chairperson. Links to rabbit clubs and photos of our show-winning rabbits can be found elsewhere on my website. Learn more about the wonderful hobby of showing purebreed rabbits. Show-quality rabbits are usually available to be picked up at shows. Our show season in Louisiana is from September through May. Sorry, no shipping of rabbits. 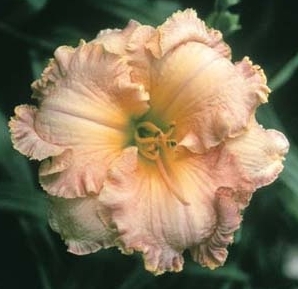 I do ship daylilies and most cultivars are usually available along with fresh seeds and pollen (in season). Please e-mail me for availability.